Another year is about to begin, and I would like again to take this opportunity to reflect on some of the things we have been studying and putting into practice during this year. This study becomes the foundation for other subjects that will emerge naturally. Everyone is busy at this moment, so please save this for later study and discussion. I expect all advanced students to keep it within reach for Saturday mondo (question-answer) sessions. Mochizuki Sensei – we call him Kancho Sensei – compared the study of budo to climbing a mountain: there is the easy path and there is the hard path. While living in Japan, I wanted to experience that directly, so I decided to climb Mount Fuji and do it the hard way, during the month of May, before the open season. There were two other factors that led to that. One factor was my being educated by Jesuit priests. They taught us to get out of any situation by cornering us and making us look inside of ourselves for strength and solutions. The other factor was advice from my father when I was a teenager: "Never choose the easy way!" At that time, those were unverified concepts which I have reviewed since then and understand better. Two experienced mountain climbers and I set out during a calm day. Progress was slow due to the depth of the snow, and we overnighted in one of the shelters near the top. The plan was to get up early and reach the summit by sunrise. During the night a violent snow storm broke out. It eased off in the morning, and we resumed climbing. Suddenly, the storm hit again. Hip deep into the snow, with no visibility at all and the wind blasting us down, we progressed slowly to the top, the almost constant sixty-degree slope being our only direction. I decided to listen to my companions. The storm stopped soon after we started going down, and we got back to our point of departure a couple of hours later. Several years later, I led a group of Canadian students to climb Mount Fuji. We took the popular path in July that time. It was the open season, with thousands of people from all over Japan climbing each day. Many Japanese consider this climb a once-in-a-lifetime pilgrimage. People get to the fifth station by car or bus, and then they climb for about five hours. In July, the snow is almost all gone, and the effort required would be reasonable for a fit person if everyone who climbs Mount Fuji were in shape. But the width of the trail can accommodate only one individual at a time with few spots to pause; it's constant up and down among lava rocks, crevices, and sand, and every time someone stops – people usually take a rest where it’s convenient for them – everyone behind is stopped. Stopping and starting is what burns the most energy. At that altitude, it’s common for people to get sick or faint. Some get heart attacks. One of the Canadians got syncope and returned to the fifth station. Then people typically overnight in one of the shelters and get up to watch the sunrise. That day, the atmosphere was clear, which was unusual for that time of the year, and we could see from Tokyo to Nagoya. The stars in the sky seemed so close that it felt as if we could touch them. The beauty of the firmament with its change of colors before, during, and after the sunrise cannot be described. Then we took a walk around the crater. The conditions were so exceptional that we were able to see the Sea of Japan. Then there was a road covered with ashes for all-terrain vehicles, presumably for the purpose of bringing supplies to the residents of the weather station and others. We slid down into the volcanic sand back to the fifth station in a very short time. What lessons resulted from those experiences? We cannot always have what we want the way we want it. There is a moment when we have to be willing to let go of our goal temporarily in order to be able to complete it later, especially when others are involved. This includes accepting the fact that we may not see the results of our efforts within our lifetime. The process determines the value of the goal once it is achieved. The intention behind the goal determines the validity of the goal. We can likewise apply these same two approaches to climbing the mountain – the popular path and the harder path – to the study of budo. The popular path is based on the concept that "if everyone does it, it must be good," while the individual path stems from the concept that "everyone has to think for him/herself." If we succeed easily, the result has little value. Those who can easily get to the top of the mountain will have little appreciation for the view and forget about it very soon. Students who are technically skilled tend to be slow at understanding the mental aspect of their training. On the other hand, students who make slow technical progress have a tendency to neglect the physical training and take refuge in the mental aspect. One cannot exist without the other. For that reason, I do not promote all students at the same speed. If a student misbehaves or quits as a result of not being promoted, it confirms that he wasn’t ready. On the other hand, if he wakes up and changes his behavior, it becomes evident that his true intention is to study. We may have chosen the harder path in order to forge our minds, but in reality, even the so-called easy path is full of obstacles to overcome. We do not need to look for challenges; they are everywhere, as in the case of climbing Mount Fuji during the open season. It’s when we mindlessly select the easy path that we are more likely to be unprepared. The person who is obsessed with goal achievements will be tempted to take shortcuts and make decisions that will have negative long term consequences. Very few of us want to listen to what we do not want to hear and develop a clear understanding of our true motivation to study budo. That is why so many students quit as soon as a challenge pushes them beyond their comfort zone. In order to be teachable, a student has to learn how to understand him/herself first. If his only goal is to know how to fight, get a black belt, be called “Sensei,” “Shihan,” open his own dojo, etc. (goals shift frequently according to the chatter of the mind) – then he is bound to fail. If both eyes are on the goal, as when climbing a mountain, we cannot see the pitfalls of the path. We sometimes feel stuck with some of the choices we made in the past. We cannot go back and change what has been done. But it’s how we handle the consequences of what we did that will determine the outcome. Budo techniques are tools to train the mind to deal with life’s difficulties (the battlefield). Once we are familiar with that process, we can apply it to other areas of life. We do not run away from uncomfortable situations or people we wish to avoid any more. We train ourselves to become familiar with our dislikes and fears. The most effective method in the beginning consists in practicing to eat the foods that we don’t like or that we don’t know, and then start doing tasks that we tend to avoid. Little by little, we will notice a shift in the way our minds react to our emotions. Most of our decisions are based on concepts. A concept may be the result of a thought process that in turn will help develop other thought processes; it may also be an unverified belief. We can see how those two types of concepts are related with each other: the first type results from individual thinking, but it can also turn into the second type if we fail to regularly reassess that concept according to our experience. The second type may also lead to the first one as the result of a wakeup call after getting cornered into a desperate situation. Some of the major decisions we unconsciously make involve the choice of a profession, relationships, and environment. If our choice is fueled by the desire for convenience, then no matter how capable we may be, we won’t grow. On the other hand, if we learn to listen to our hearts and train our minds to serve our hearts with wisdom, we are more likely to make choices that will benefit every one. We can share only what we have. Another significant lesson I learned from those experiences is that exposure to danger can result in a deeper understanding of what is important in life, if we want to look at that aspect. I have also discovered that we do not always need to expose ourselves to physical danger in order to reproduce that state of mind. Meditation training provides us with effective tools that will not jeopardize anyone’s safety. Please remember that none of all these ideas should be seen as ultimate. Their purpose is to serve as a foundation for thinking for oneself based on one’s direct experience. Thank you again for your continuous support and trust. Kaoru Sensei and I wish you Happy Holidays and a happy and healthy new year. P.S. I have been spending the holidays in Amiens, France, with my parents, my sister and her family. They have been supportive of my activities since my departure in 1970. Every year I have been consecrating this moment to them. 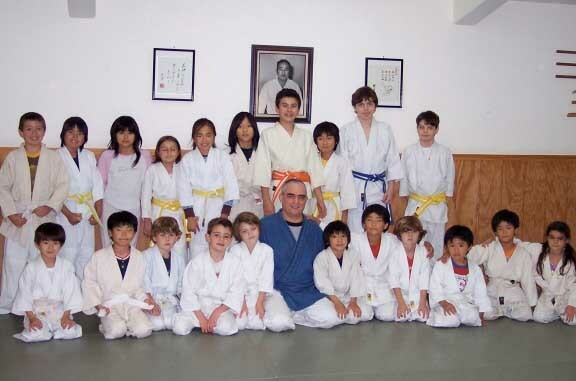 For the last twenty years, I have also been holding a clinic at my first teacher’s dojo, Professor Michel Bourgoin, followed by his son, Frédéric Bourgoin. Yesterday, I had the unique opportunity to participate to a clinic with Professor Shozo Awazu, who visited this city for the first time. 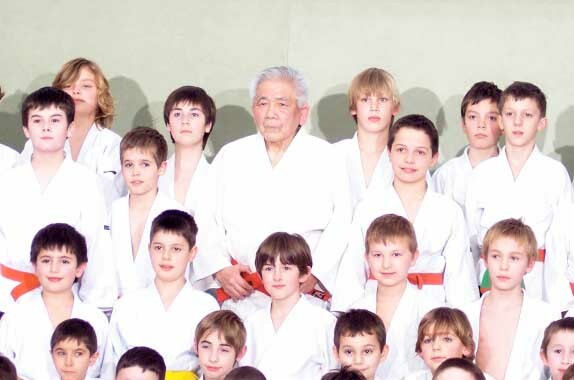 Professor Awazu has been in France for over fifty years and is one of the pioneers of judo in that country. At eighty five years of age, he keeps on teaching and is recognized as a great ground work expert. During his clinic, Professor Awazu demonstrated and explained the importance of returning to the sources of traditional judo, as the only way to remediate to the negative consequences of the present obsession with competition and extirpate judo from the dead end toward which it has been deviating. His enthusiasm, firm kindness and serenity got everyone’s attention. Even the disturbing elements in the children’s class were paying attention! After the clinic, we were ten senior students to have dinner with the master. There he lectured us on the spirit of mutual welfare and best use of energy. He also spoke to me about Ueshiba and Mochizuki Sensei whom he knew well. That clinic was organized by Professor Frédéric Bourgoin whom I thank from the bottom of my heart for giving us that opportunity.